When the ghost of the beautiful Diane de Poitiers appears in front of you, you are transported back in time in Amulet of Time: Shadow of la Rochelle! Explore France and an incredible love story in this amazing Hidden Object Puzzle Adventure game. Uncover a conspiracy against the king’s mistress and protect her to return to the present. 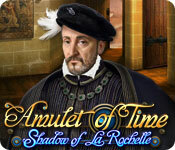 Live through an incredible tale in Amulet of Time: Shadow of la Rochelle! The same crazy geniuses who brought you Chainz offer you the latest in maddeningly addictive puzzling and thirst-quenching fun.